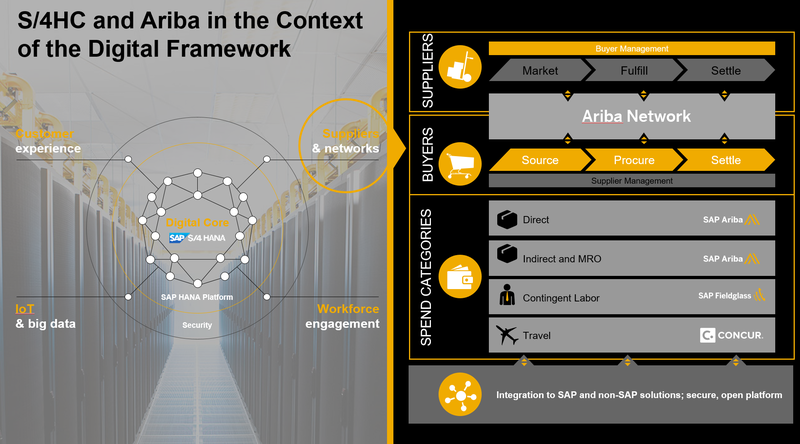 The intent of this blog is to offer guidance and insights into how customers can partner with SAP to drive procurement transformation. I will specifically focus on two SaaS solutions (Cloud Procurement and Cloud Services Procurement) helping to drive the procurement transformation and when it makes sense to combine these solutions with the SaaS Cloud ERP. Engaging with business stakeholders on strategic topics like business transformation. Shifting from selling products to delivering solutions. The value capturing of procurement changed rapidly during the last years and the pressure to stay agile and innovative will not slow down. Therefor procurement needs to be properly staffed with resources, processes and the underlying technology assuring the required high performance and high value impact can be achieved. touchless e-invoicing with full visibility for buyers and suppliers avoiding phone call’s and email follow up activities. The Cloud ERP solution covers operational procurement processes like requisitioning and order processing, invoice processing, order confirmation and operational contract management with embedded real-time analytics out of the box. If indirect spend is a significant cost driver, customers should leverage the Cloud Procurement Buying solution either managing all indirect procurement within the Cloud Procurement solution – available with one of the next Cloud ERP releases or running all indirect procurement in the Cloud Procurement solution. The source-to-settle process will be completed by applying the Cloud Procurement Sourcing tool. If the success is highly dependent on ‘WHO’ gets the job done, it is critically important to identify the right candidates from the ecosystem of contractors. This includes resume reviews, candidate onboarding, certifications etc. than this is a task for Cloud Services Procurement. Direct material procurement is handled by the Cloud ERP solution. Customers with a need for supply chain integration and collaboration with forecast commit, schedules, inventory, consignment, contract manufacturing should plan to investigate the capabilities of the Cloud Procurement Supply Chain Collaboration and Clod procurement Direct Material Sourcing to reduce cost of goods sold as well as better leverage supplier innovations as well as PO and Invoice exchange solution for effective supplier collaboration. The Supplier management process needs to be performed where the operational procurement takes place, in case this is done in the Cloud ERP the master data, supplier evaluation (supplier performance eg delivery performance, quality etc.) is managed within Cloud ERP. Depending on the amount of PO’s and Invoices either the Cloud Procurement suite offer a commerce automation solution (PO and invoice exchange for effective supplier collaboration)- if the amount of PO and invoice documents are of a high volume, if the document number (of PO and Invoice documents) is lower Invoice management by scan and capture will help to drive AP document throughput within the AP team. Nice post. I learn something totally new and challenging on websites I stumbleupon every day. imessage for pc It’s always useful to read through articles from other authors and practice something from other sites.